The Finnex FugeRAY Marine+ 2 packs the light output of the original Marine+ in a much more economical package. This Contemporary Ultra Slim designed LED fixture features a series of LEDs to promote Marine Refugium & Freshwater growth. Unlike the Ray II which incorporates multiple High Output LEDS pinched together for high light output, the FugeRay features a more evenly spaced LED alignment ideal for refugium purposes as well as low-medium light needy aquariums. The FugeRay Marine+ also features moonlights on a separate switch, which can be activated during the evening to give the aquarium a pleasant moonlight tone. All models feature a moisture resistant PC Splash Guard to protect against water mishaps. Unlike the Ray II DB which incorporates multiple High Output LEDS pinched together for high light output, the FugeRay Marine+ features a more evenly spaced LED alignment ideal for general marine aquarium applications such as soft coral stocked or fish only aquariums. 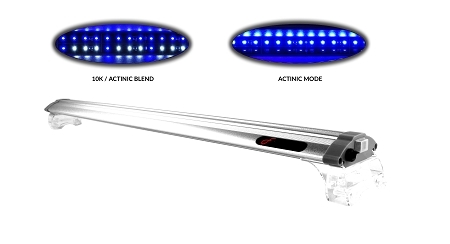 This all-round all purpose light also features its actinic moonlights on a separate switch, which can be activated during the evening to give a pleasant moonlight tone further making corals vibrate throughout the aquarium. The durable high output LED bulbs are built to last 40,000+ hours. With a LED spread of 120 degrees, this slim LED bar lights up the largest of aquariums. A unique leg fixture allows this LED light to mount on various sized aquariums and sump setups. To extend LED bulb longevity, the circuit boards are built with high quality aluminum and the fixture itself acts as the heatsink to allow ample cooling and superior heat dissipation.